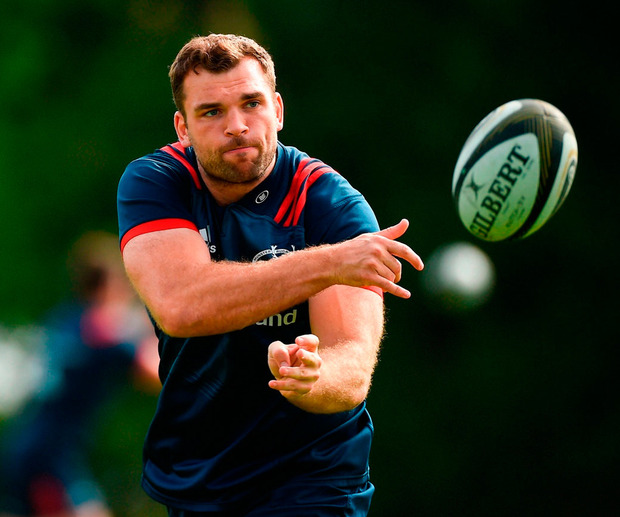 To understand what being back in Ireland playing professional rugby means to Tadhg Beirne, it's important to rewind the clock and remind ourselves of how close he came to giving up on his dream. After all, it's only two years ago that he'd signed up to do a Masters in Real Estate, using the money he had saved from delivering pizzas to pay for the course. What he has achieved since has been nothing short of staggering as Beirne has not only revived his career, but has also become one of the best players in Europe. "I haven't really had a chance to stop and think but I probably will look back and think about that moment when I almost did pack it in - I might still have to go back to delivering pizzas when I retire though," he laughs now. Beirne is sitting in Munster's high performance centre in UL when we meet. He is totally comfortable in his new surrounds, which is helped by the fact that he got his house sorted last week, bringing an end to the commute from his native Eadestown in Co Kildare. Up to that point, Beirne had been crashing with Andrew Conway, the pair recalling how far they have come since their days together in the Leinster Academy. The trek down the M7 is a familiar one for Beirne, not only because he has been driving it for the last few months. The 26-year-old's mother Brenda hails from Cahir, which meant that Beirne and his sisters spent many a summer in the Co Tipperary town. Munster is in his DNA, and while it might not be his home province, he has a deep understanding of what it means to pull on that famous red jersey. "To say when I signed for Munster that my mum's side of family were happy would be an understatement," Beirne smiles. It was around this time last year that he put the finishing touches on his move back to Ireland. Beirne had just come off an outstanding season, which culminated in the Scarlets destroying Munster in the Guinness PRO12 final at the Aviva Stadium. It's not always the case that an Irish player leaves home and has such an immediate impact on his new club but the Scarlets were as much a good fit for Beirne as he was for the Welsh club. Leaving Leinster wasn't easy, yet he didn't exactly have a choice in the matter as the province opted to focus their attentions on other locks coming through. Injuries certainly didn't help his cause and when he went looking for a new club, Wayne Pivac at the Scarlets offered what Beirne felt was his last shot at making it in the professional game. If departing his home province was tough, then saying goodbye to the Scarlets was tougher again. Beirne was a big crowd favourite in Llanelli and he was thriving in their expansive style of play. "The way everything panned out, it couldn't really have went any better for me," he maintains. "I just fitted into the culture there and the way they played. I went in low on confidence and thinking I was good enough but not really knowing for sure if I was. "They got me up to the standard that I needed to be at and got me to an international cap. I have a lot to thank them for." Everything changed however, when Beirne's phone rang in the weeks that followed the PRO12 success, as he recalls. "It was about this time last year really that we (Munster and I) started speaking - I did have a phone call from Joe (Schmidt) in the end. "From that point on, it wasn't an easy decision but it was made easier by knowing that I needed to be in the country to have an opportunity to play for Ireland." Leaving the Scarlets came with a pressure of its own. Beirne was very much settled in Wales and uprooting again meant that he had to make it work for himself. Earning a first cap in the second Test against Australia during the summer certainly helped ease any tensions. "I did find it difficult," Beirne says of his first few days with the Ireland squad. "The first two weeks of Irish camp were... I don't want to say not enjoyable but I put so much pressure on myself to get up to speed because you're in such an intense environment for such a short period, and you need to fit into the systems and the way everything is done. "Those two weeks were just flat-out learning more or less and making sure you don't make mistakes, because you don't want to be the one in that environment to make a mistake. "I suppose it's pressure more than anything. Once you get familiar with the calls and that kind of stuff, I started to relax and enjoy myself a lot more. Thankfully I got to put on the jersey then. "Hopefully now that I am back, I will actually be able to get selected (regularly). "There is obviously pressure here to play well. I'm not where I want to be at the moment so I can feel that pressure. "In my head that probably plays on me a little bit as well. I know I need to play a lot better if I want to be playing at international level. "My focus now is with Munster and getting my performances right, then hopefully the Irish selection will follow." Beirne has fitted in well to the set-up in his first four games, but by his own admission he has been nowhere near his best just yet. Changing systems and style of play takes time to adjust to, and having gone through the same process when he left Leinster for the Scarlets, he knows that he must be patient. "I've been quite frustrated with my last two performances, to be honest. I just kind of felt that I didn't get into games as I would have liked to. "It took me a long time to find my feet with the Scarlets too, I wasn't even selected for a long time there. "It has probably been a bit of a slower transition than I would have liked. And I'm probably still not fully where I want to be in terms of the way we are doing things here - like being up to the knowledge of the systems and fitting into it properly. "I'm not a million miles off either. But look, I know the process. I know what's needed." Beirne insists that he has been given the same freedom to go after the ball at the breakdown as he had with the Scarlets but he is trying to become smarter in how he goes about it. Opposition teams know how efficient he is at forcing turnovers, which means that Beirne now has to think outside the box. "At this stage, I'm trying to pick my rucks a lot better because I found, especially at the tail end of the season, I was kind of wasting myself and my energy at certain rucks. "The defensive system here is different to Scarlets as well in terms of the way boys tackle and that kind of stuff. "Sometimes there might not be as many opportunities to go at the ruck. That's just the way it is. "If I see the opportunity there, I'll go for it and if I get a turnover, I get a turnover but I don't want to get too worked up about not getting turnovers either because that's not the only part of my game that I should be focusing on. "I don't think any team should play to just one player's strengths, if you want to be successful. "You go out with a plan and if people are going off on their own tangent, it's not going to work. "I do think you need to fit in and all good players will be able to fit in, but still express themselves in those systems. I'm just hopeful I am going to be able to do that too." Beirne was signed by Munster primarily as a lock and while he can easily slot into the back-row, he sees the engine room as his best route into the Ireland team. This evening at the Aviva, with his family watching on from the stand, Beirne will return to face his former club once again, and while the last couple of results against Leinster haven't gone his way, the former Clongowes Wood student relishes any chance to get one over on them. "My parents aren't big fans of Leinster any more since I left," he adds. "I enjoy playing Leinster, sometimes it brings out the best in me. I've had some of my better performances against them. "It's not something I would go into thinking I have an extra edge here but obviously it's somewhere in my head without me really knowing it. "I know I can perform against them and I enjoy playing them but the last two times I have played against them haven't been so enjoyable. I'm hoping Saturday might be a bit different." Daragh Small From operating toy helicopters to sitting in the cockpit of a real plane, Conor Oliver hopes to make the miraculous transition this year.